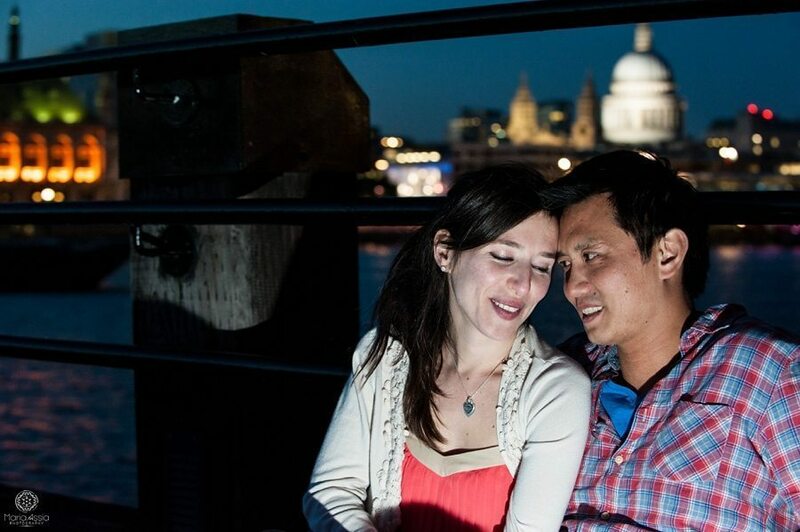 As a London Wedding Photographer, I love a good challenge and Jo and Frisco really delivered. When they contacted me, they had a very specific idea of what they were looking for from their engagement shoot. 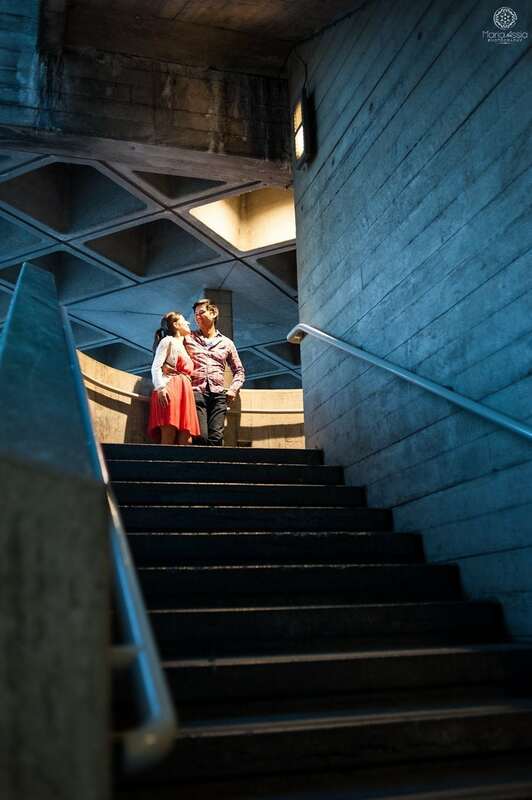 They wanted their Southbank Pre-Wedding Shoot to feature London, to showcase some of the city’s sites and to have the London feel, but without seeming like tourist photographs. 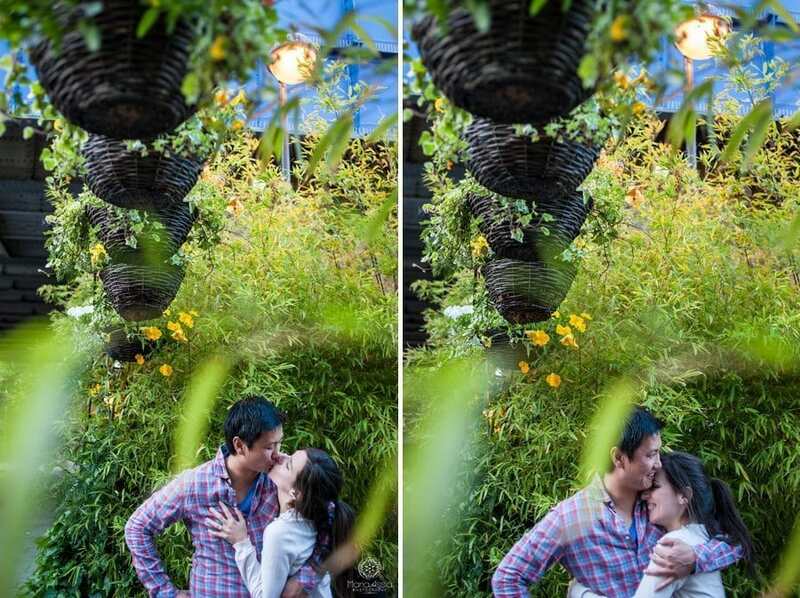 Suffice it to say, this piqued this London Wedding Photographer’s interest and had my creative juices flowing. On one of the few gloriously sunny days this year, we met at Southwark station and after a few quick captures headed out from there. I really like Southwark station. 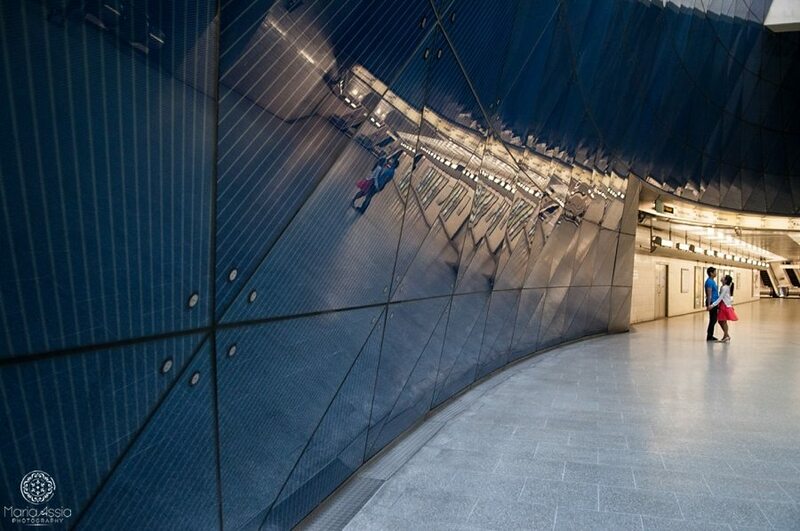 It’s a typical Jubilee Line station with modern design and heavy use of concrete and lights. I used to work just opposite the station and on my daily commute, I would always see the blue ‘solar-panel’ looking wall. On this day, I knew I had to use it and I love the results. One of the major icons of London is the Thames, so I wanted to get a shot of its beautiful old piers before the tide came in for the day. With about 20 minutes to spare before all of the beach would be flooded and underwater, and surrounded by rustic pipes and beams, Jo and Frisco joked around and made me crack up in the evening sun. We then headed over the the Tate Modern, where we took a new angle of Saint Paul’s Cathedral and I love the contrast between Jo and Frisco’s intimate loving embrace below the bridge and the busy hustle and bustle of the tourists above, walking, talking and looking over to Saint Paul’s Cathedral. That’s often how London is in my mind – pockets of quiet and closeness surrounded by busy-ness and buzzing. After a quick break we headed over to Waterloo and the National Theatre and Royal Festival Hall. 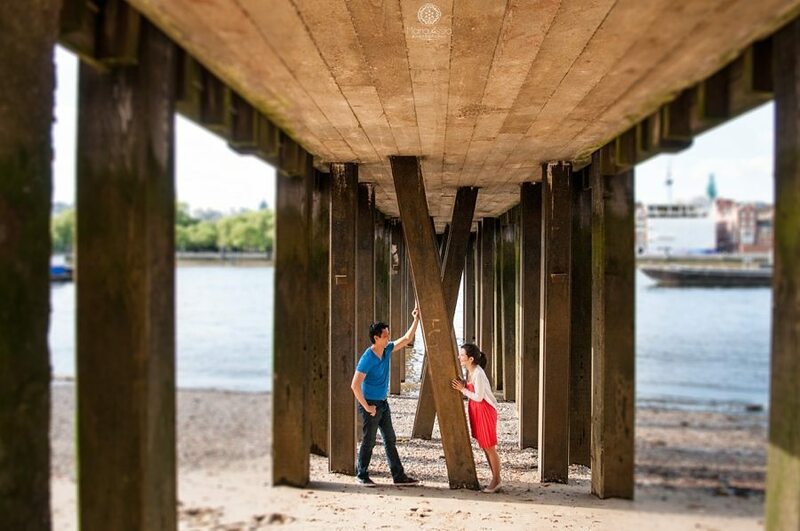 I love these Southbank pre-wedding shoot images. They are so recognisably London, but at the same time so just about Jo and Frisco. 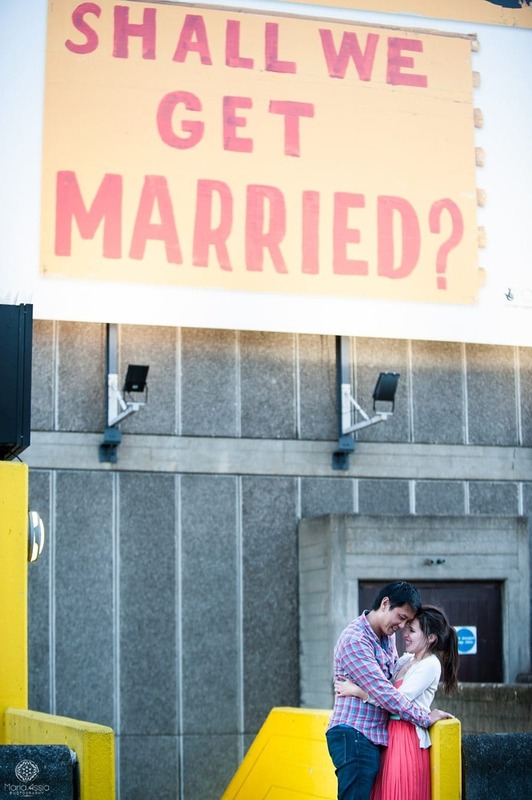 And what do you think about that “Shall we get married?” poster? A bit cheesy perhaps, but also fun and sweet and too good to pass up. 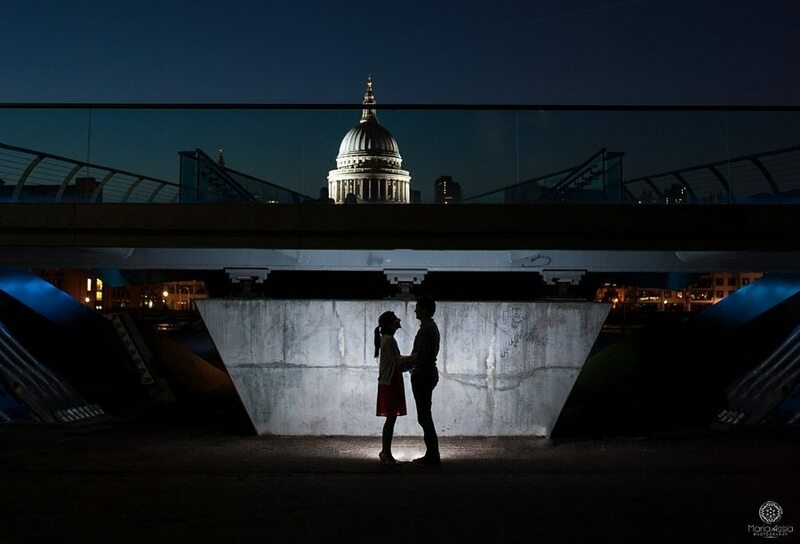 With the sun setting, the people disappeared and we managed to capture some last intimate night time shots ending this Southbank pre-wedding shoot at Millenium Bridge and the stunning view over to St. Paul’s Cathedral again. What a difference a few hours make! Thanks to Jo and Frisco for this great evening. 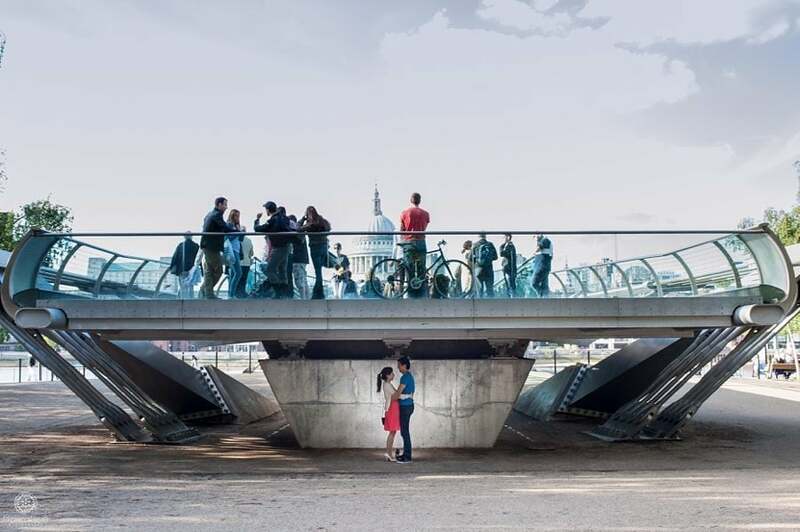 If you’d like have a look at the photos from their amazing Porto wedding and if you are looking for a London wedding photographer for your London or Southbank pre-wedding shoot, drop me an email to check my availability. Lovely shoot Maria and a nice variety of locations…most of which also remind me of my daily commute to South Bank in my former life. You’ve done them proud 🙂 I particularly like the escalator shots (were you there at the crack of dawn?) and love the reflection in the blue panels! 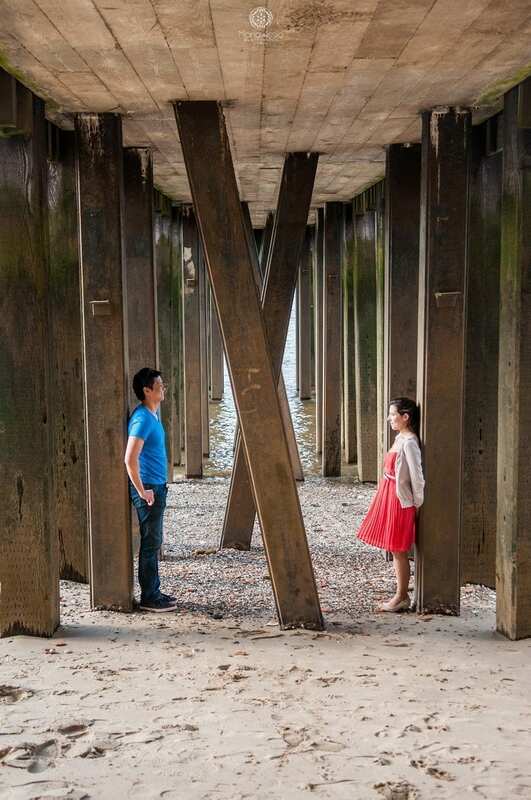 Excellent portraits along the Thames Path- I really like the one with the happy couple under Gabriels Wharf. so creative Maria! and did you bring that “married” sign along with you in your kit bag? !